Posted in: Radio Control. Tagged: Documentary, Miscellaneous, Racing, RC. Have you ever heard of Marty McDaniels? I hadn’t until I read his story. Marty is a resident of Homewood, a small neighborhood located in Pittsburg PA. Homewood has a high unemployment rate, a reputation for violence and is a place trying to put its gang problems in the past. Marty McDaniels is like many of us in respect to his passion for building and racing RC’s. Marty also sees RC’s as an alternative to the hardships and temptations that surround him and his community. 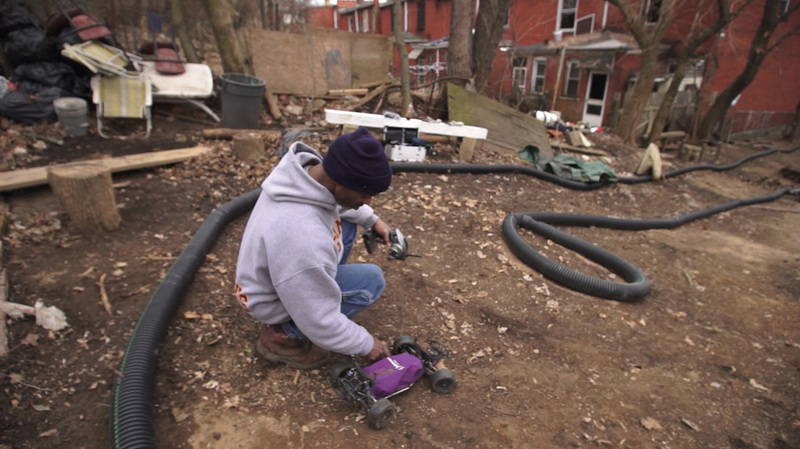 Marty has built and maintained a Backyard Track from items he has found discarded in his neighborhood. He wants the track to be a place where kids and adults can race free from fear and intolerance. Marty McDaniels spends his spare money on car parts and track maintenance and was recently awarded the $1,000 Awesome Pittsburgh Grant. He plans to use the money to clean up the lot, buy some landscaping tools, install some professional track tubing and buy professional grade dirt to give the track a clean surface. In addition to the grant, Mr McDaniels was the recent subject of a documentary done by Daliborka Films, a small Pittsburgh-based film production company, owned and operated by Keith Reimink. You can follow the progress of the film and find out how you can help with Marty’s project by contacting Keith through his website or Facebook page. We have reached out to Keith to get some more information and we will update when we have it to pass along. This is a great project that we support. RC’s help bring together so many families and thus communities, why wouldn’t it work Homewood. We applaud Mr McDaniels and wish him success in achieving his vision. Something like this will take a lot of help and hopefully once some more people and some of the RC companies see his story they can figure out a way to help Mr McDaniels.